Topics: Outdoor Kitchens, Walls, Interiors, Masonry Paths, and Concrete Driveways. Ecommerce Corporation (Ohio, Columbus) is the location of the Apache server. There are 2 Nameservers, ns16.hostexcellence.com, and ns15.hostexcellence.com. 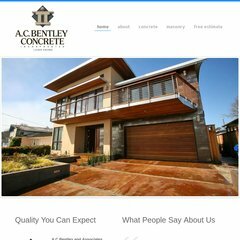 Acbentleyconcrete.com's IP address is 98.131.232.172. PING www. (98.131.232.172) 56(84) bytes of data. Pinging the server, resulted in a 45.2 ms response.